This kitchen contraption wasn't the first thing that came to mind upon hearing the term Sushi Bazooka. The idea of fresh seafood fired straight down your throat is pretty exciting. 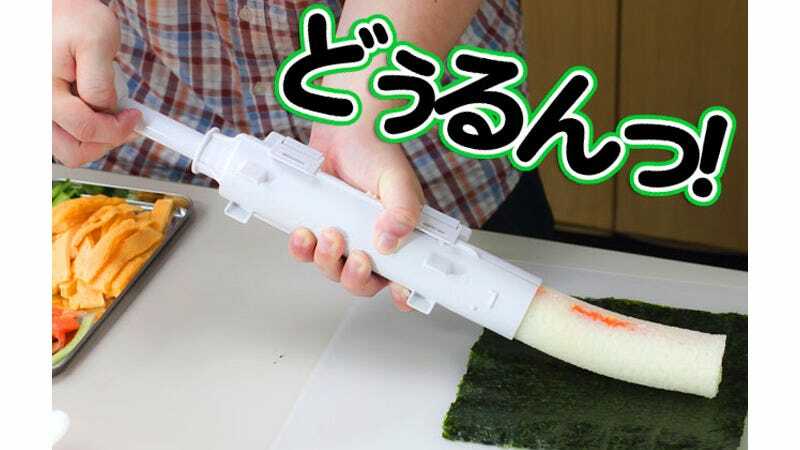 But so is this device—which plunges a cylinder of raw fish like a culinary caulk gun—making it much easier to roll our own sushi. The results might not look as fancy as the rolls you get at a restaurant, but home-brew sushi is a heck of a lot cheaper. And with this bazooka, it's also a heck of a lot easier to DIY, even if the extrusion part is unsettlingly disgusting. To use it, you simply crack open the $25 device, fill it with rice and other ingredients, seal it back up, and then pump out a long tube of fresh fish and veggies that's easy to then roll in nori—aka seaweed sheets. It's not how the pros roll, but then again, how do you know what the sushi chefs do when you're not sitting at that counter, watching their every move?